In a cave off the Great Salt Lake in Utah, archaeologists have found a trove of game gear. The material dates back to the 1200s and includes dice, hoops, and carved sticks, which the archaeologists believe were used for gambling by the short-lived Promontory culture. That the Promontory had the time and resources for gambling during a period of prolonged drought in the Southwest suggests the group was relatively well off. 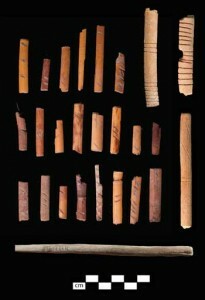 Similarities between the items and game materials from other areas have also helped the archaeologists in their study of Promontory migration. After 26 years studying an eighth-century pottery plate, archaeologists with the Nara National Research Institute for Cultural Properties in Japan have decided that the plate was likely used as a game board. They believe the game was similar to Yut Nori, a traditional pastime in Korea, and that the plate is evidence of cultural exchanges between Japan and the Korean peninsula.